H. Stuart Knight, 88, the Director of the United States Secret Service who restored the agency's reputation and who oversaw the investigations into three assassination attempts on two presidents, died of chronic obstructive pulmonary disease September 7, 2009, at Arleigh Burke Pavilion, a military retirement facility in McLean, Virginia. He was a longtime resident of Falls Church, Virginia. Mr. Knight became the 15th director of the Secret Service in 1973, appointed by President Richard M. Nixon, whose life he probably saved 15 years earlier when a mob attacked the car of the then-Vice President in Caracas, Venezuela. Mr. Knight's promotion marked an effort to return luster to the name of the then-108-year-old agency after it was tarnished in the Watergate scandal. Mr. Knight was the man in charge during two unsuccessful assassination attempts on President Gerald R. Ford in 1975 and an attempt that wounded President Ronald Reagan in 1981. Although Secret Service agents, as well as bystanders and police, prevented those incidents from becoming fatalities, the spate of assassination attempts that came so close to success alarmed the public. Mr. Knight told a Congressional hearing weeks after the Reagan shooting that rules limiting the sharing of information between federal agencies had hampered some of the Secret Service's work. The FBI, for example, knew about an arrest of Reagan's attempted assassin, John W. Hinckley Jr., in Nashville months earlier, but that information was never passed along to the Secret Service. Protecting the president, Mr. Knight later said, is "a living nightmare in a democracy." The Secret Service protects other high-ranking government officials, and in 1958, Mr. Knight and a team of agents accompanied Nixon on a South American goodwill tour. In Caracas, a mob said to be agitated by Communists attacked Nixon's limousine, shattering the windows and almost overturning the car. Mr. Knight and his fellow agents warded off the attackers and were struck by bottles and stones, but Nixon escaped safely. 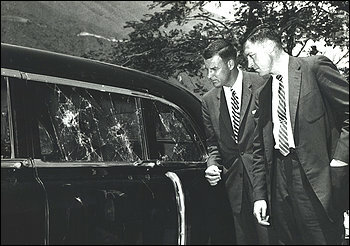 be agitated by Communists, who attacked Vice President Richard M. Nixon's car in Caracas, Venezuela. Mr. Knight retired in 1981 after a former Assistant Director whom he had tried to force into retirement was promoted to a higher-ranking new Treasury Department post. The unusually public struggle reflected the Secret Service's attempts to shake off the legacy of the Watergate scandal, when Nixon administration officials used agents to spy on presidential candidates during the 1972 campaign. Investigations found that the agency also tapped the phone of Nixon's brother, opened the White House safe of E. Howard Hunt after the Watergate burglary and operated the secret White House taping systems. Mr. Knight was credited by his subordinates with expanding the Secret Service's training and modernizing its management techniques while keeping it removed from partisan politics. "Director Knight provided exemplary leadership to this agency," Secret Service Director Mark Sullivan said in a statement. "His work leaves an indelible mark on the Secret Service which will serve as a lasting legacy in his honor." Mr. Knight was born January 6, 1921, in Sault Ste. Marie, Ontario, and raised in Detroit. He served in the U.S. Army in the Pacific theater during World War II. As a Staff Sergeant in the Rangers, he received the Silver Star for his actions in battle when he left the safety of a foxhole and dragged an injured colleague out of the line of fire. Mr. Knight was shot multiple times in the leg by a .50-caliber machine gun, which resulted in his receiving the second of two Purple Hearts. He also received a Bronze Star Medal. After the war ended, Mr. Knight became a U.S. citizen. He joined the Secret Service in 1950 and was assigned to the Detroit field office. He later worked in the presidential protective division and in a variety of field offices and headquarters positions. Before his promotion to the top job, Mr. Knight was assistant director of administration. "What we do is to keep the odds at the lowest minimum possible, given the nature of the society in which we live and the nature of the society in which a president has to function," he said at the time of his retirement. "The speed with which you can get around the country makes it more difficult now." Mr. Knight also vowed not to write a tell-all book. "A great deal of our effectiveness is based on the mutual respect and trust we have with the people we protect,'' he said. "I think I would erode that respect even if I wrote vignettes, telling tales out of school." 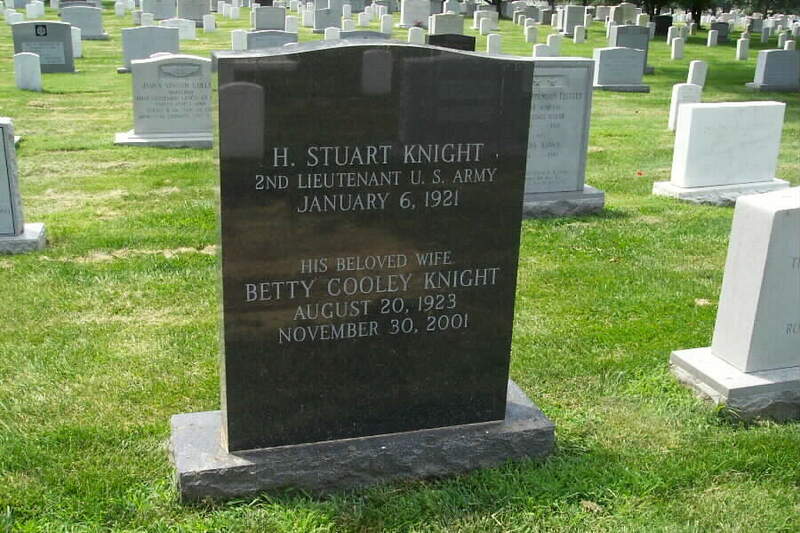 His wife of more than 50 years, Betty Cooley Knight, died in 2001. Survivors include five children, Suzanne Cawley of Keyser, West Virginia, Bill Knight of St. Louis, Robert Knight of Alexandria, John Knight of Nokesville and Barbara Powell of Richmond; and two grandchildren. 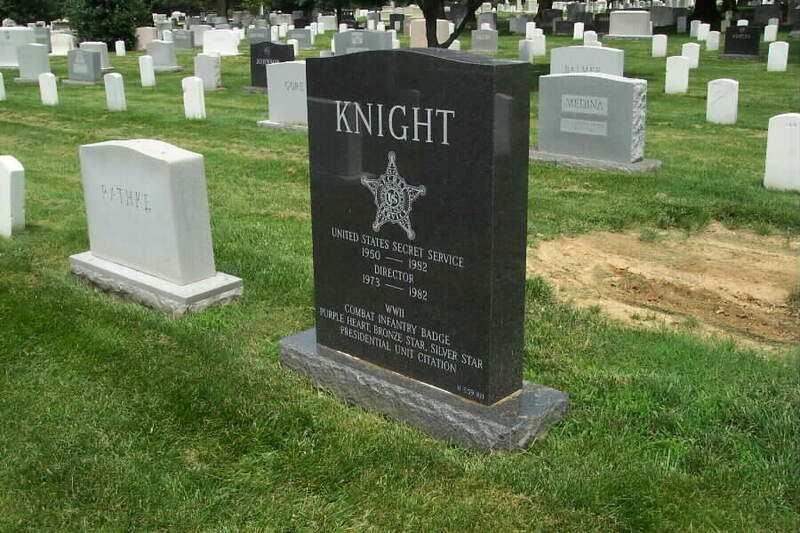 H. Stuart Knight will be laid to rest with full military honors at Arlington National Cemetery on 24 November 2009 at 3:00 PM.